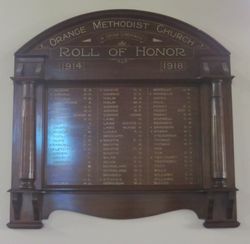 A wooden honour roll commemorates those from the church who served in World War One. The permanent record of 66 Methodist soldiers and nurses who had enlisted from the Orange Circuit, was unveiled by Chaplain-Captain Wilson on Sunday, 16th November, the church being packed to its utmost capacity at both services. On the Saturday night previous a dinner was tendered to all returned men who happened to be in Orange, the Minister for the Navy, Sir Joseph Cook, and Chaplain Captain Wilson being present. The Rev. C P. Walkden Brown occupied the chair. After the loyal toasts had been honoured, the chairman, on behalf of the Methodist Church, said he was glad to welcome the returned men. The Church had tried to keep in touch with those from Orange who had gone to fight for King and country. They were deeply gratified, as Methodists, that God had spared them to return, and they looked to them for the salvation of their country. On Sunday, November 16th, there was a military parade to morning service and another military service at night when the honour roll was unveiled. 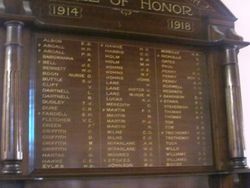 The memorial is in the form of a tablet of highly polished Queensland maple, with names of the soldiers in letters of gold, a cross indicating those who had made the supreme sacrifice. Methodist (Sydney, NSW), 29 November 1919.